Taxation on goods, income or wealth influence economic behaviour and the distribution of resources. For example, higher taxes on carbon emissions will increase cost for producers, reduce demand and shift demand towards alternatives. Higher income tax can enable a redistribution of income within society, but may have an impact on reducing the incentives to work and supply labour. Income tax is a levy on income earned. In the UK, the basic rate of income tax is 20%. If there is an increase in income tax, what impact does it have? Less discretionary income. Those paying income tax will be left with less discretionary income to spend after income tax has been deducted. This is likely to lead to lower levels of household spending and lower levels of household saving. However, if the government spend the tax revenue – overall aggregate demand (AD) will not be affected. Substitution effect. Higher tax leads to lower wages – and work becomes relatively less attractive than leisure. The substitution effect of higher tax is that workers will want to work less. Income effect. However, if higher tax leads to lower wages, then a worker may feel the need to work longer hours to maintain his target level of income. Therefore, the income effect means that higher tax may mean some workers feel the need to work longer. This means there is no guarantee of the impact of higher tax – it depends whether substitution effect is greater than income effect. Laffer curve. 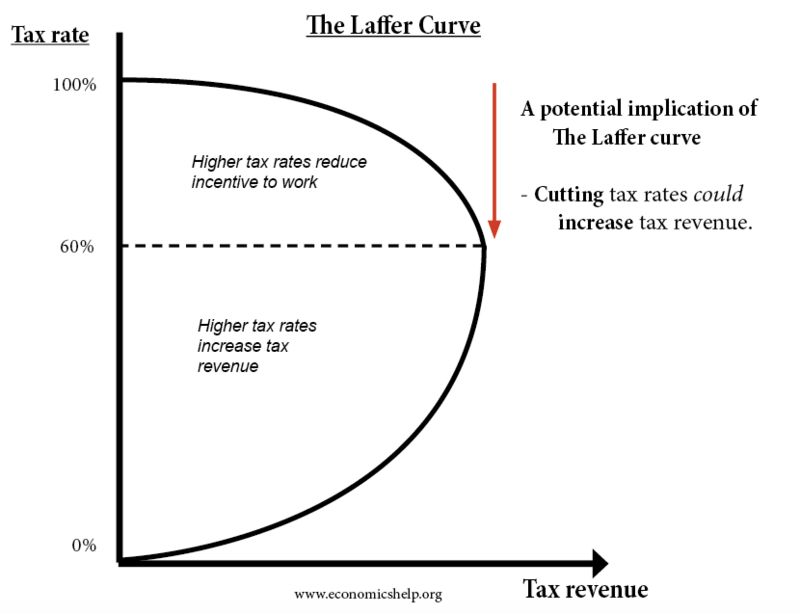 The Laffer curve is analysis which suggests at some tax rates, higher income tax will reduce incentives to work and actually leads to lower tax revenue. Impact on distribution of income. Income tax is a progressive tax. In the UK, there is a tax threshold of £10,000, with a higher rate of income tax of 40%. As income rises, the percentage of income paid in tax increases. 16% of all income tax revenue is paid for by the top 1% earners. Income tax has a role in redistributing income and offsetting more regressive taxes, such as excise duty and indirect tax. What is the effect of an increase in the overall tax burden? This is the % of GDP that is collected in tax. This can vary between countries. Generally, less developed economies have a lower tax burden, more developed economies have a higher tax burden. 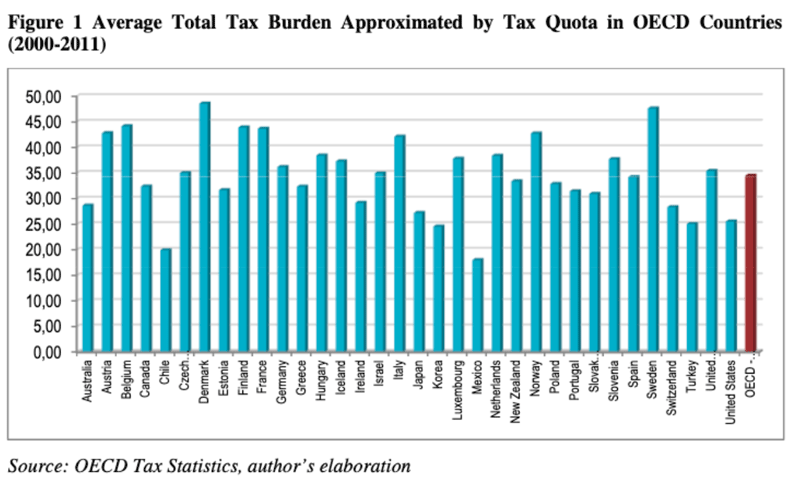 For less developed economies, the tax burden tends to be lower because of difficulties in collecting taxes and less developed economic and political institutions. To some extent a rise in the tax burden shows a relationship with economic development. However, there are still variations – Sweden and the US have similar levels of GDP per capita, but the tax burden in Sweden (45%) is nearly double the US (25%). This reflects the more extensive welfare state (free health care, education) in Sweden than US. Some argue that the high levels of tax in Nordic countries can act as a disincentive to growth and investment. On the other hand, the stability of a welfare state, health care and education reduces uncertainty and problems such as health bankruptcy. There is no clear correlation between the tax burden and the rate of economic growth in the long term. The impact of indirect tax is more of a microeconomic issue. 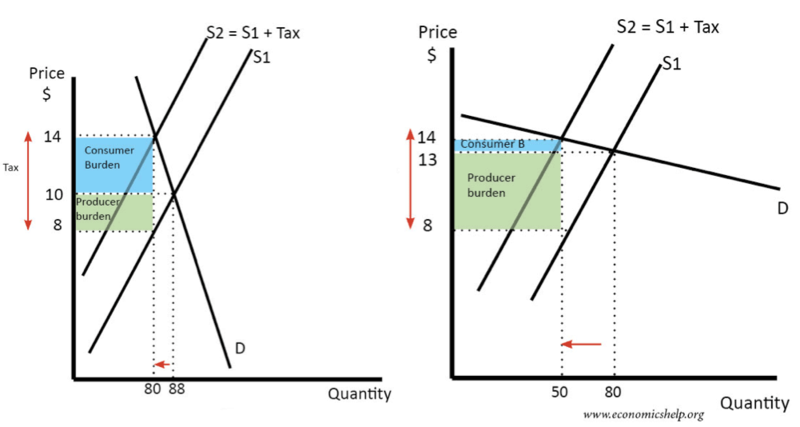 Where demand is price inelastic (left), the tax leads to a rise in price from £10 to £14. The consumer burdern is £4 x 80. The producer receives £2 less so the producer burden is £3 x 80. 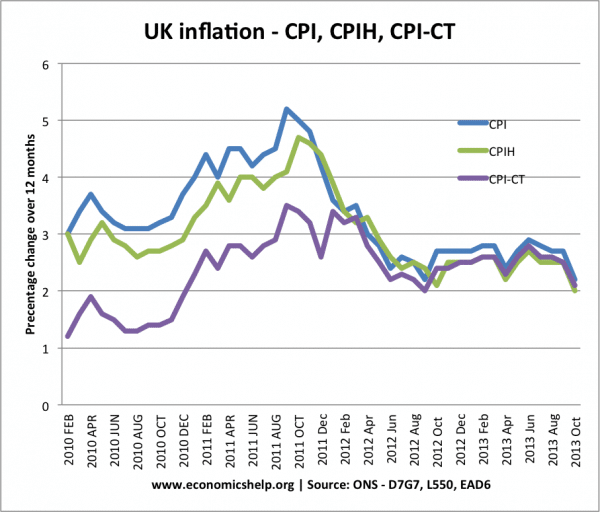 However where demand is price elastic (right) the tax leads to only a small rise in price from £13 to £14. The consumer burden is relatively smaller. A rise in excise duty or VAT can lead to one-off price increases. Therefore, it tends to cause cost-push inflation. However, the inflationary impact of the tax increase will only last one year (unless it changes expectations of inflation). 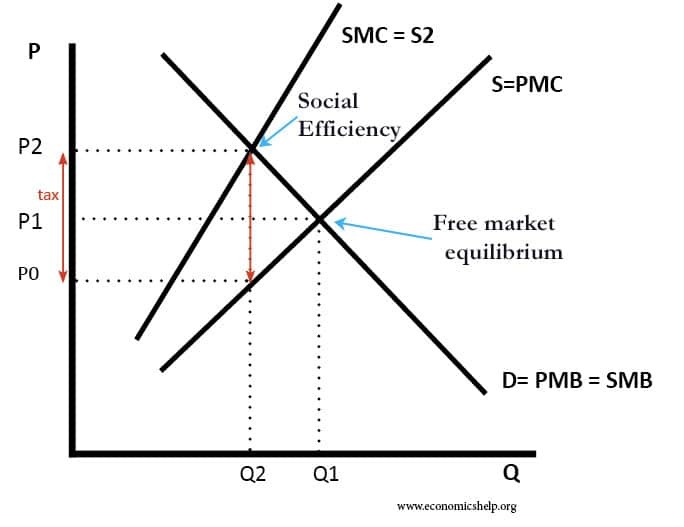 The logic of taxes on demerit goods and goods with negative externalities, is to make consumers pay the social cost of the good and internalise the externality. Without tax, the market price of producing chemicals, may be less than the social cost. The tax can increase the price to reflect the greater social marginal cost. 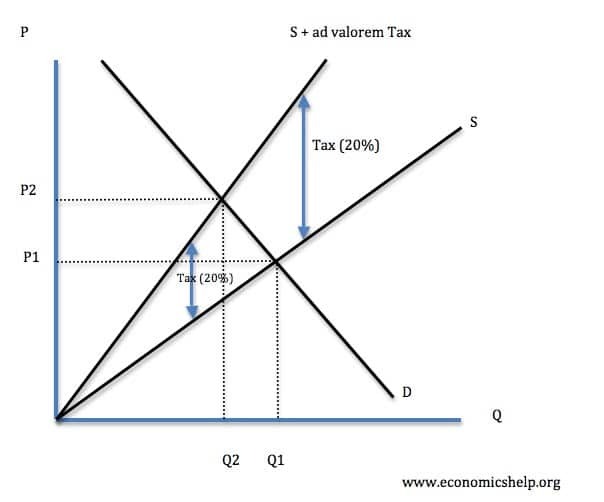 In the above diagram, the tax of P2-P0 increases price to P2 and reduces demand from Q1 to Q2.